Abstract: ERMPVF refers to a voluntary group of which monitors accurate radioactive dose and evaluates its influence independently on the residents’ side in the vicinity of Fukuichi. The monitoring has been conducted three times in the past, October and November in 2012 and January in 2013. Data obtained is compiled per case, also plotted on maps, and reported to the residents closely every time. I would like to report the details of these monitoring at this conference on behalf of ERMPVF. ERMPVF was established in order to let the residents know more accurate radioactive doses, implications, and influences resting on our firm will that there must not be this kind of corruption. ERMPVF started monitoring first in the Oshigama Haramachi district, Minami Soma City, which is located approximately 15km to 30km north of Fukuichi. Then, we had already known that there is an awful hot spot emitting nearly 300μSv/h in a pilot survey. In spite of a danger of very high radiation, some people still live in this area with fear. Moreover, to our surprise, Minami Soma City planned a Half Marathon for the whole city dwellers in December 2, 2012, just after ERMPVF activity started. Immediately realizing how dangerous it was, we conducted a close monitoring of radiation doses along the entire course 4 days before the scheduled marathon date. The result was 1.55μSv/h at the highest to 0.51μSv/h in average. We sent a letter of notice reporting the results to the Mayor of Minami Soma City, all the departments of Minami Soma City Hall, Marathon executive committee, and mass media such as TV, radio, newspapers that planned and supported this dangerous marathon. In addition, we posted to the mailing list of overseas anti-nuclear power plant. The monitoring results obtained in this round is shown in Figure 1.
red: High risk measurements (μSv/h); the highest count 1.55μSv/h, the lowest count 0.25μSv/h, average count 0.51μSv/h. The measurement was made every 54-m span along the course. Under such circumstances, Marathon was carried out against an opposition of many people. A total number of about 2,300 citizens including 800 able-bodied children took part. Surprisingly, another Marathon is planned on March 10 this year. We have a firm will to stop it. So, we have started a protest to organizers, co-sponsoring, the Mayor of Minami Soma City and the Board of Education by e-mail or phone again. ERMPVF has already carried out three rounds of monitoring. About 20 to 30 volunteers including experts from different cities, namely, Tokyo, Kanagawa, Chiba, Saitama, Yamagata, Fukushima, Nara, Osaka participated in the monitoring. We stayed at the Gan-okuji Temple of Buddhist So-to Sect for a 2-day and 3-night mission.Our usual meeting spot at a local community center that has a public monitor is 1.0μSv/h in an aerial dose of 1 meter high above the ground. Nevertheless, people in Minami Soma City are living normally in the same way as in Tokyo and Yokohama. I can not help being surprised at that. Such things must not happen. The value of monitoring post in the HorseRacing Park en route in the marathon course, indicates a very high ratio of 0.964μSv/h. The name of Minami Soma City takes a Chinese character “horse” in its expression. This symbolizes a town that people and horses have co-existed for long. The following is shown as a result of the past three rounds shown in Figures 2, 3 and 4. The fact we gained in the first round is that contaminations over the 0.23μSv / h of national safety standard spread out widely. Also in this area, especially in the mountains, a high contamination in more than 1.0μSv / h level spread also widely. 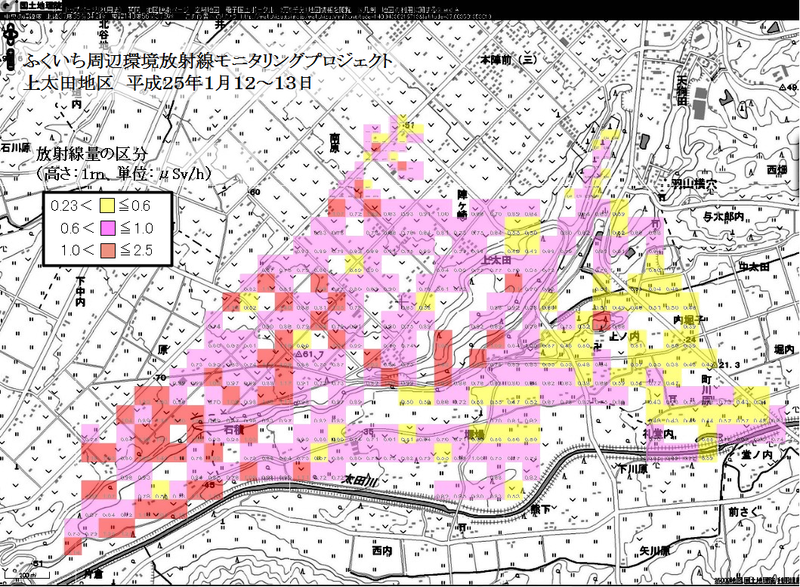 Even in residential areas where people can’t evacuate, the radiation level is 0.6μSv / h equivalent to that of the radiation controlled area. The fact in the second round is that a more than 0.60μSv / h rate equivalent to that of the radiation controlled area spread out over the entire region. Also in this area, especially in the mountains, an off-limits area of more than 2.5μSv / h spread out in a wide range. In this area, 2/3 of people appear to have evacuated. On the other hand, some people can’t evacuate still now. The fact in the third round is that not all of this area corresponds in the radiation controlled area. However, since the area of more than 0.23 to 0.60μSv / h spreads out, an anti-radiation mask and a set of protective gear are required to live there. This area is entirely flat, but many spots are over 0.6μSv / h which fall in the radiation controlled area. Currently, ERMPVF monitoring activity has just started. The results should be free and open to many people and the public.Since in the monitoring process we adopt accuracy and particularity as our motto, it might conflict with personal data and privacy in many cases. Therefore, in order to open our data publicly, we are obliged to receive a permission of local people who own a house, field and forest in the covering area. Even though a result touches a piece of personal information, it is eerily expected that a massive diffusion of radioactive materials contaminates unspecified number of people and causes a seed of health hazard in the quite long range. Therefore, we believe that all the results obtained should be released continuously in the future, while we consider personal information and privacy to the utmost. In conclusion, as a result of three rounds, no one should live in the covered area. If people live there, the maximum level of radioactive protection should be prepared and provided. No.1: Keep off the mountaions area. No.2: Complete decontamination for all houses and buildings. No.3: A long stay and recreation in a safe low dose area throughout the year. No.4: Immediate evacuation for children. This is the most important action. No.5: Intake foods and drinks only produced in the safe low dose region. 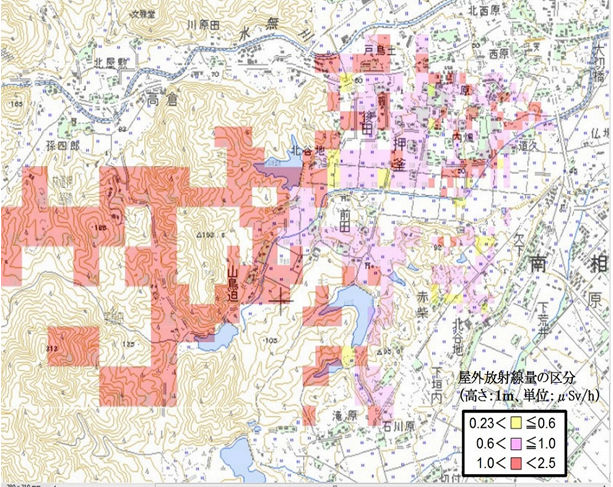 ●During the monitoring period, in some places, “black substance (so-called hot spots)” was found here and there. It sticks to the surface of asphalt and concrete in a form such as moss. This records a high rate of dose. Once in a case, when a probe of TGS146 Hitachi Aloka model surface CPM counter was placed very close to a kind of the substance, the probe ruptured. Though a cause of this accident has not yet been identified, the radiation from the unknown material is consistently high. ●A lot of contaminated garbage and wastes from each family was left untouched and squashed in the depot. At the last year end, the prime minister was replaced in an election from Yoshihiko Noda, the Democratic Party, to Shinzo Abe, the Liberal Democratic Party. Right after this regime change, the trusted Abe administration shifted positively in the promotion of nuclear power. This is their top priority ignoring even a widespread contamination. I can’t help acknowledging that a pile of contaminated garbage and waste left untouched means a symbol of this country that continues to disregard the lives of the people in Fukushima. Not only in the Fukushima prefecture, life and existence of people are being neglected but in the region that has been highly contaminated. As if nothing had happened before and after the awful accident. ●Please just imagine. This is a very unreasonable and impermissible area where people can enter but can’t live in. I saw a warning sign probably hand-written raised in the entrance of a house. A symbol of radioactivity blurred exposed to the weather. How did the owner of this house feel when he made his house keep off? My heart aches painfully in an imagination. ●In addition, in front of this house there was a small lot where garbage placed with a hand-written radiation mark. The dose was drastically up when a Geiger counter came close. Garbage left in this manner are scattered here and there. ●According to a hearsay of the residents in Minami Soma City, a sort of fish caught in a nearby river showed tens of thousands Bqs in a count. This is a horrible report. In one of the monitored area, we encountered a herd of wild monkeys. Probably they are also severely contaminated. Monkeys do not know anything. Contacting with innocently contaminated wild animals will remind us of the arrogance of human beings that could rank atop in the order of living creatures. ●I saw a very shocking scene in the third round. Two young sisters in childhood were watering flowers happily together in a garden that showed a high dose of 0.5 to 1.0μSv / h. I had never seen any children in last two rounds. Innocent children and an invisible monster called radioactivity lived together. This combination upset me most. Any children must not absolutely be in this area. Even adults beyond doubt. ●The more we do monitor, the more residents come to talk to us. Some drivers stopped their car and came up to us and asked. Their concern is a ratio of exact dose of radiation. We replied “Since the radiation level of this area is as high as in an X-ray room in a hospital, so people must not live in anyway.” “Why do the central and municipal governments announce we can go back to our homeland?” He continued angrily. But they cannot raise their voices alone. In short, it is a sort of antithesis to the country declaring everything safe. This is the disjunction and division of community made intentionally by the evil atomic power mafia. ●After each round, we always organize and open a report meeting to the residents. It is because we recognize that the essential things are the importance of the need to monitor in a small mesh format over the vast land and that of residents to share the data. Our absolute purpose is for residents to be able to use the data as their arm and protection, when required. ●Now in Japan, we hear the news of air pollution caused by M2.5 in China almost every day. 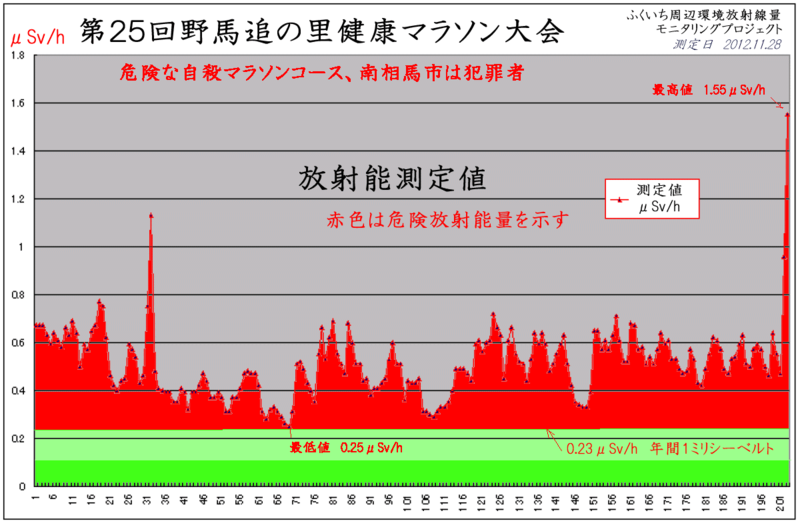 On the other hand, there is very little news about scattering radioactivity from Fukuichi(Fukushima Daiichi NPP). Before denouncing China, firstly, Abe administration should seriously ask themselves about the responsibility of Japan that continues scattering the radioactivity in the whole world. ●”100 new nuclear power plant expected in Asia”, on the front-page of The Nikkei newspaper on February 15, 2013 (Fri.). It reads that Prime Minister Shinzo Abe began talks about nuclear power plant exports with prospective clients, Vietnam, Thailand, Indonesia, India, Saudi Arabia and others. Catastrophe of Fukushima Daiichi Nuclear Power Plant has not finished yet, it will continue for decades and centuries from now on. One of Japanese saying tells “No sooner were the words out of his mouth than he denied what he had said.” Immediately after the accident, the government seemed to give up the dependence of nuclear power. However, Abe administration will promote the nuclear power much more than before the 3.11 tragedy. ●IAEA meeting was held in Fukushima in December 2012. In a stage of actual contamination, the international atomic mafia is trying to appeal how small the damage of the Fukushima Daiichi Nuclear Power Plant affects the health hazard. Especially, their initial safety campaign must gain momentum to a bigger and wider level voicing loud “No influence on the human body.” This is a recurrence of the ABCC or Atomic Casualty Commission established immediately after Hiroshima and Nagasaki A-bomb attacks. Nowadays, Japan has turned into a lawless nation as well as disregards human life. Under such circumstances, the role of our project which stands firm on the residents’ side could be enormously important and remarkable. I’m so happy to have your compliment. Can you imagine how I was encouraged when I read your comment? ERMPVF will conduct the fourth round monitoring at the end of April. I agree. These are powerful sentiments as well as powerful data to offer the world. From our standpoint in science and technology studies, the challenge rests in gaining better knowledge about how exactly such information becomes suppressed in the Japanese context. If the acceptable annual dose of radiation exposure in Japan is 1 mSv (0.23uSv/hr), and the entire region tests high, this seems a surprising outcome as compared to how public health standards would be enforced at least in the United States. Am I just being naïve here? From the other articles in this Virtual Conference, I note the connection to the role played by visualization and public contributions to monitoring efforts (but clearly configured differently here); and a concrete account of the changing image (and role) of the Mayor of Minami Soma. With regards to the latter, I see the tension between images of health / healing / recovery / risk / and death, and the silent references to rural poverty and communities with limited means and limited options encoded in the phrase, “of people who can’t evacuate.” The actions of the mayor seem to refer to a certain kind of resilience, based on perceived obligations to ‘his’ community, where radiation risks become negotiable in the face of other possibilities and necessity for continuity. Yet these responses do seem unique in some ways; universal (or at least trans-national), as Sharon would warn us, in other ways. 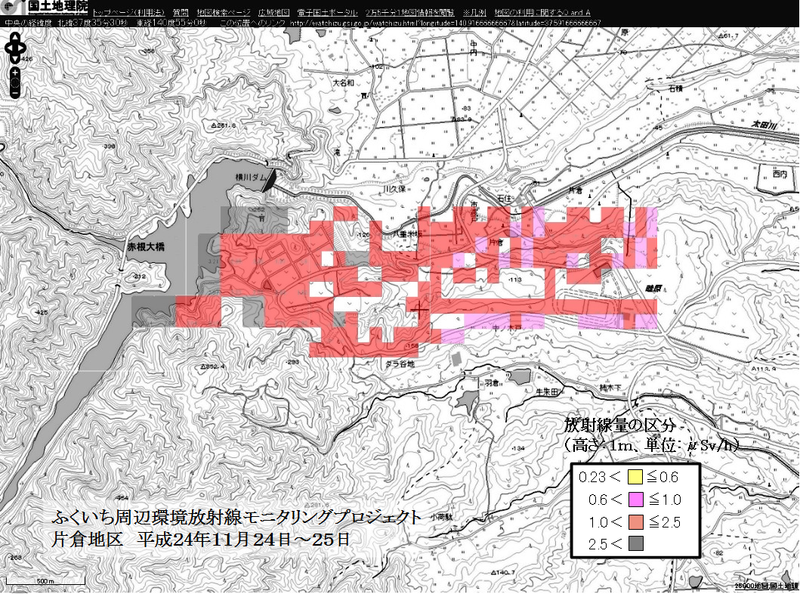 Also I was wondering: What has been the government’s radioactivity monitoring efforts (and obligations) in this area? Do they contest the data that your organization produces? I’m really happy to hear your relevant comment. As you know that the acceptable annual dose of radiation exposure in Japan is 1 msv. It is provided by law. However, the entire areas we measured are far beyond it. It is obviously illegal. The results speak for itself. And lots of people including children still live there without any help from the government! The government and the local government seem to ignore our monitoring results. We will keep on measuring from now on. I think radiation risks never become negotiable matter. First and foremost, the government must protect the people against the radiation that they have scattered all over Japan. Thank you for your important work! Like Atsushi, I am curious about responses over the disparity between your readings and those provided by official government reports, which I know are widely considered disreputable and even deliberately misreported. I am also interested in identifying the role of visualization in helping to characterize the risks of exposure for “people who can’t evacuate,” especially in revealing the institutionalized tensions between governmental evocations of community and stoicism and the practical disempowerment of rural people in Tohoku and elsewhere. I think, too, about the aftermath of Hurricane Katrina, and the ways in which government aid was delivered differently for different groups of Americans following that natural/man-made disaster. Thank you so much for your nice remark. division of their community and the feeling of being left alone. Some seem to want to forget the nuclear accident itself, the others try not to think of radioactivity. I consider the accident of the Fukushima Daiichi N.P.P is a man-made disaster! Nevertheless, the government has not worked well even now since the catastrophe two years ago. This is the global issue due to the radioactivity. It scattered not only all over Japan but also all over the world. seems to be similar in Japan and the U.S. This might be a universal issue.